We hope you had a wonderful Christmas with your families and that 2015 will bring you good health and prosperity in every which way. Our year has been fantastic and very busy. 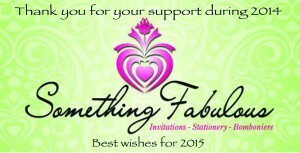 We would like to take this opportunity to thank all our customers for their support throughout 2014. The Brides & Grooms have given us lots of positive feed back about the Invitations, Place Cards, Menus etc, they received. We are stoked about that because ultimately that is where we strive for. We are aiming to go even better in 2015. They have entrusted us with their stationery, and like all the other arrangements they have made, they want it to be perfect leading up to the big day! We are looking forward to another year of happy Brides & Grooms! Please keep a look out for more inspiration and new ideas in this blog throughout the new year. Even better come and say “hello” at one of the Bridal Expos coming up soon on the Central Coast. See first hand how beautiful our invitations are put together. We will be there to give you advice and help you along in starting the invitation process. I will let you know where they are as the dates draw closer. Meanwhile, have a great and safe celebration from Old to New and we’ll see you next year! This entry was posted in Here & Now, Invitations & Stationery. Bookmark the permalink.